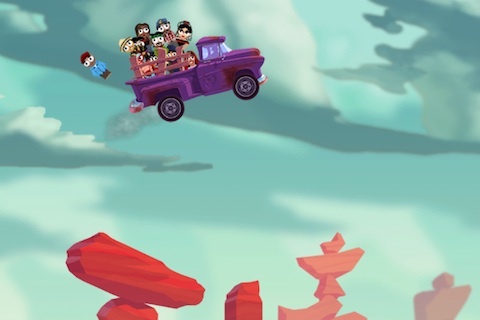 Snuggle Truck (renamed from Smuggle Truck so it can be approved by Apple) is a new iPhone and iPad game by Owlchemy Labs. You are delivering fuzzy animals in the back of your pickup truck to the zoo. If this seems a bit weird, it gets better. The original game was called Smuggle Truck, (note the M vs. N) and featured a satirical look at the illegal immigration at the US Mexico border. An old truck overflowing with illegal immigrants runs through the desert, jumping over platforms trying to enter the United States. As you can imagine, using such a controversial subject led to the Smuggle Truck app receiving publicity (the bad form) from activist groups and eventually led to the game being rejected by Apple. To get the app into the App Store, Owlchemy Labs renamed the iPhone and iPad version to Snuggle Truck. The Mac and PC version of the game is now sold under the Snuggle Truck name sold directly from the Owlchemy Labs website price at $4.99 right now. The game itself looks has polished graphics and is a fast paced 2D platformer with the added complexity of having to keep gravity contained passengers on board. Sometimes when you hit a huge bump, a few of your passengers fly up in the air, and you can tap the left side of the screen to break and catch them as they fall down. Snuggle Truck has 40 levels right now, separated by difficulty ranging from Easy, to Medium, Hard, Extreme, and The End. Game physics are really easy and fun actually. Just tile left or right to control the angle of your truck in mid air, to make for a smooth landing. The levels move from the desert to underground tunnels lit by lamps, to forests and more. You tap the right side of the iPhone to speed up and the left side to slow down. In game graphics are like artwork rendering super colorful 3D levels, done by the same artist who did the graphics for “Curse of Monkey Island”. Sound effects and music are pretty engaging and a little goofy too sounding a bit like an old cartoon. For some reason the music makes me think of the classic Sanford and Son soundtrack. There is a nice award system in the game too to keep things challenging. You can earn up to 5 awards per level. If you drop fuzzies along the way you’ll lose points so you can go back and replay any level to earn max awards. Bring every toy to the finish line to get an ‘Ark’ award, and go faster than your previous speed to earn the ‘Speed Run Award’. 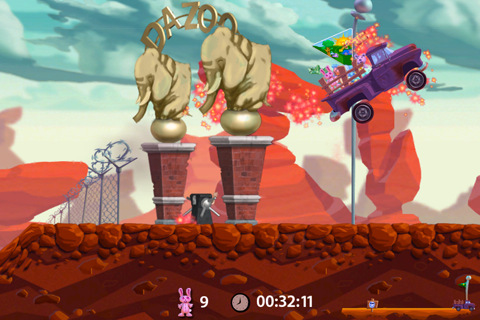 If you are a fan of 2D physics based platformers such as Alpine Crawler or Alpine Crawler Wild Snuggle Truck is a must have game. The stick figure characters in Smuggle Truck had a slight resemblance to the artwork used in the South Park cartoons but now you’ve got fluffy squeaking teddy bears. As the driver, you try to keep your cargo of fluffy toys (illegal immigrants) inside the bed of your pickup truck. Keep them from falling off while hitting some huge bumps and getting some major air driving through the desert. If you could get your passengers safely across the border, you’d be rewarded with a “green card” in the original Smuggle themed game. To make matters more gruesome, if you managed to only arrive with one passenger, you’d be awarded a “Smuggler’s Run” award in the game. Another feature was that babies were actually born while en route, so you had to keep them safe too if you wanted that “green card”. in an interview with New York Daily News. was inspired by the frustration our friends have experienced in trying to immigrate to the United States. With such a troublesome issue being largely avoided in popular media, especially video games, we felt the best way to criticize it was with an interactive satire. Now you can buy Smuggle Truck directly from Owlchemy Labs, and Snuggle Truck for iPhone and Snuggle Truck HD for the iPad. And if you buy both the Mac an iPhone version, you can use the iPhone app to control the Mac. 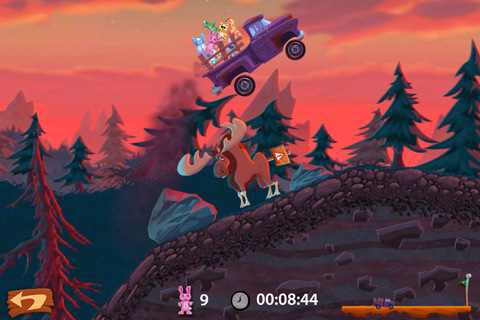 AppSafari review of Snuggle Truck (aka Smuggle Truck) was written by Joe Seifi on April 28th, 2011 and categorized under App Store, Featured, Games, Platformer. Page viewed 7459 times, 1 so far today. Need help on using these apps? Please read the Help Page. This game looks hilarious – PC suppressive a-holes can go shove it – if you are offended, don’t buy it, don’t play it, ignore it…. Quit forcing your imperialist dumbing down ideals on us freedom seekers. Love it ! When can I buy it? I would love to play this game? Is it not on iTunes ? Can’t wait for this app. It looks like great fun..
Sure it looks fun and all if you are on our side, but I guess it might not be fun and games to those other folks on the other side of the fence, huh?